Our very first installation! Note the switch against the module. Not compliant! but then we trusted the electrician and the inspector! In mid 2010, we completed our very first installation, using all-black SolarWorld (Made in Germany) modules, KACO Gmbh (also made in Germany) inverters; Alzone racking — manufactured in Australia. While the components were industry leading (though we prefer Schletter racking now) and the installation was, generally speaking, well executed, the electrician saw it fit to fix the switch to the module (as seen in the image, invalidating the warranty of the module). It has taken iEnergytech years to weed out practices such as these and develop the install standards it is so proud of today. 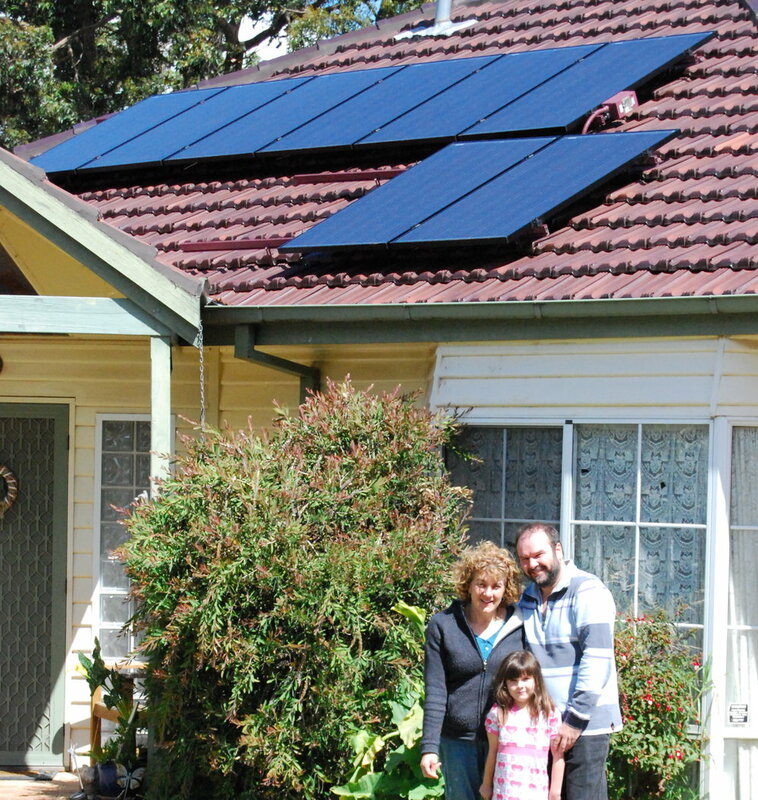 We have had a 1.5kW photovoltaic system installed by iEnergytech, and consider ourselves lucky to have found a reputable installer in what I find to be a confusing environment. Whilst I am an electrical engineer working for the airlines in a high-tech industry, my solar power research had found a confused situation with different companies making quite different claims about what seemed very similar products. We have learned along the way that this is not so - some of the systems out there are not very good at all. Myself and my wife found Udayan to be very knowledgeable, about the technology and the industry, and quite forthright about the different systems available. We were looking for a high-quality, reliable, system, and Udayan’s system design using 185 monocrystalline SolarWorld AG modules and a KACO New Energy GmbH inverter has provided this. Udayan went out of his way to provide full information up front, including detailed estimates of costs and savings, which he allowed me to assess and change. He spent time answering my queries, even corresponding with the module manufacturer to get answers. He provided full technical information, and good financial and schedule estimates. He managed our installation, so that we had little stress, and kept us informed along the way, explaining the (complicated!!!) bureaucracy before and during. I met with his electrical installer at a site visit prior to installation, and during the installation, and was impressed with his knowledge and the workmanship in the final product.